We’d love your help. Let us know what’s wrong with this preview of Attaching in Adoption by Deborah D. Gray. Buy with confidence - satisfaction guaranteed! Writing on a few pages. Binding tight. Some shelf edge wear, indentations, and corner bumping to dust jacket. Gently used copy in good condition. To ask other readers questions about Attaching in Adoption, please sign up. I've read so many adoption books in the last couple of years that they are starting to run together in some respects. They often give the same advice, in different words, and to that degree, this book is not much different from others I have read. And yet, it kept my attention riveted much more so than most of the others. The reason? Well, I suspect that it's the real-life vignettes that pepper every chapter. It's difficult to imagine, before you are even in these situations, what it might really I've read so many adoption books in the last couple of years that they are starting to run together in some respects. They often give the same advice, in different words, and to that degree, this book is not much different from others I have read. And yet, it kept my attention riveted much more so than most of the others. The reason? Well, I suspect that it's the real-life vignettes that pepper every chapter. It's difficult to imagine, before you are even in these situations, what it might really be like to face the challenges that professionals outline. However, when you're reading the stories of real parents and real children, it hits home in a different way than a list of possible problems and therapies does. 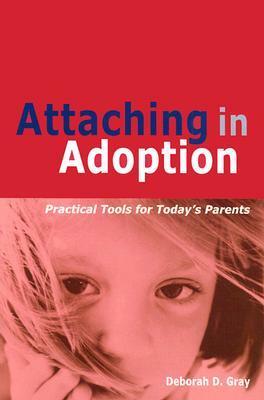 Attaching in Adoption gives a clear, concise outline as to what issues children may face, the different stages of attachment and how children react when attachment bonds are lost during each stage, and how to attach to children in any of those stages, including those who are having attachment difficulties. Some problems are of course exacerbated by additional problems, such as delays in development and/or affects from neglect, abuse and more, and this book also covers those issues, as well as the scary buzzword that throws fear into the hearts of all adoption-hopeful parents, "RAD." My wife and I are adopting and this was one of the books recommended to us by the adoption agency. This book made a lot sense to me. Children need healthy, secure attachments with their parents. If they don't, every area of their life will be affected. But adopted children have experience deep loss—often early in life—that affects their natural desire to attach. Deborah Gray presents a lot of information about ways that you can promote attachment with your children. It provided a helpful picture o My wife and I are adopting and this was one of the books recommended to us by the adoption agency. Deborah Gray presents a lot of information about ways that you can promote attachment with your children. It provided a helpful picture of ways that children might try to avoid attachment and ways to respond. If you read one book about Attachment, this should be it. Lots of helpful information presented in a dry way - definitely wasn't an easy read, but learned much. Incredible book about adoption and attachment! Packed with a lot of useful information, pulling no punches. It is overwhelming what the kids go through though, causing you to pause and think often. This book is a little frightening, to be honest. The vignettes are very honest and many are quite sad. However, it does give adoptive parents hope that even in the most extreme cases children can be loved and parented toward healthy attachment. I did not read all of the attachment phases, but only those which will apply to our family. Then I picked up again at Chapter 11 to complete the book. I'm usually not so economical in my reading, but desperate times and all that. I know this is a book tha This book is a little frightening, to be honest. The vignettes are very honest and many are quite sad. However, it does give adoptive parents hope that even in the most extreme cases children can be loved and parented toward healthy attachment. I did not read all of the attachment phases, but only those which will apply to our family. Then I picked up again at Chapter 11 to complete the book. I'm usually not so economical in my reading, but desperate times and all that. I know this is a book that I'll use again and again through the years as a resource and guide. I wouldn't recommend it to non adoptive families, though I do believe there are things which every parent can learn by reading this book. It simply isn't a worthwhile resource for the non adoptive families who are unlikely to face attachment issues. There are some excellent examples of good parenting between these two covers, but good parenting theories, ideas and practical advice can be found in any number of other books. I'm not even half way thru and I am gaining so many practical tools from this book. It's exciting to find a book that can offer so much valuable and specific information to benefit my clients! It actually makes me optimistic. It is also current, which is refreshing and makes me realize how anyone thinks they can write a psych book or self-help book, but few actually accomplish an impressive and useful work. On the negatives, it's terribly written! I wonder if Gray even had an editor as some of th I'm not even half way thru and I am gaining so many practical tools from this book. It's exciting to find a book that can offer so much valuable and specific information to benefit my clients! It actually makes me optimistic. It is also current, which is refreshing and makes me realize how anyone thinks they can write a psych book or self-help book, but few actually accomplish an impressive and useful work. This book provides a good overview of what to expect regarding attachment during each childhood development stage. This should be required reading for every social worker, foster parent and adoptive parent. You will refer to this book repeatedly while raising your children. I just wish that the social workers that I was working with while I was a foster parent had read this book. Heck, I wish *I* had read this book while I was a foster parent. It would have helped everyone involved tremendously. So far this is my second favorite adoption book; Parenting the Hurt Child by Gregory Peck is my favorite. Attaching in Adoption is a rather deep book, one that will require more than one read. It's not quite as practical as Parenting the Hurt Child but covers more of the "why" behind some children's behavior and attachment difficulties. The two books together give us a great idea of the different issues we could face and some practical suggestions for how to start off on the right foot. This is the quintessential book for future adoptive parents. A must read - though it will only help to academically understand the issues related to attachment and the risk of RAD. A personal note, however, there is nothing that will prepare you for the real challenges of attachment with an adopted child. The best hope you can have is that some of the the strategies and instruction from Deborah Gray will stay in the back of your mind when in the thick of things. The first year is always the hard This is the quintessential book for future adoptive parents. A must read - though it will only help to academically understand the issues related to attachment and the risk of RAD. This is a well written, comprehensive 5-star book that covers a multitude of adoptive and foster situations, with its writing purposed to address the variety of relationship issues that present themselves when a child leaves one family to join another. Foster and adopted children clearly experience relationship heartbreak in ways we could never imagine, and this book makes that clear. Thankfully, the author shows us the way to correct such issues. This book was a great review of attachment difficulties that children entering adoptive homes face. It gives a lot of information about different stages of attachment and where children should progress to at each stage. This was helpful information. The emphasis on returning to early childhood activities (rocking, etc.) to fulfill needs was the most helpful portion of this book to me. I thought that my 10-year-old foster-adopt son wouldn't like things like "little piggy." I was wrong. We adopted our daughter (internationally) over a decade ago, and I have returned to this book annually to refresh my memory on what is *normal* for adopted kids. It is well-researched, supportive, and a great reminder that hurt children can heal with the right tools. Although anecdote heavy, the chapters are easy to navigate and focus on what we as caregivers can do to guide children through tough times. Add this book to your toolkit if you are parenting a child with a difficult background. Lots of information that is good to have covered before taking an adoptive placement, and definitely a resource to have on hand to reference in specific cases. She does a great job covering all kinds of adoptive placements (foster, international, etc) and giving examples which helped keep it from feeling too clinical. Very accessible. This book was honest and raw, if you are considering adoption this is a good book to read. Adoptions are not for the light of heart and neither is this book. If you can't read about the hard stuff than you certainly will not be able to deal with it when the time comes, this book will help you be prepared. Compelling, honest, helpful, and hopeful. This book helped me travel back through the stages of attachment and see where my child was disrupted (during foster care and adoption) in his development, attachment, and why his relationships are inappropriate and controlling. This book has been the MOST helpful of the books and books and books I've read. This book was recommended by my adoption counselor. It was fantastic! I highly recommend this book to anyone who is adopting. Ms. Gray gives excellent advice on signs to look for of various adoption issues, there are helpful vignettes, and practical advice on how to address various issues. I finished this book feeling better informed and prepared for adoption. This was a great general overview of common adoption issues. There are many resources listed throughout and featured in the back of the book. I'll be keeping this copy for future reference. However, I would say that sometimes the language wasn't for the average lay person and seemed aimed at professionals in the adoption field. Comprehensive (and a bit overwhelming). But, the author, who is extremely experienced in the therapy of adopted kids, has the viewpoint that it's better to be prepared than to just believe that love/nurture alone will solve everything. this is pretty much the bible on attachment for adopted kids. totally helped prepare me for what to expect and really breaks down the stages of attachment and what to look for. lots of great vignettes about what helped other families. definitely get this book if you are going to adopt! Good resource for adoptive parents. I would recommend reading the first few chapters and then skimming over to the parts that are most relevant for your situation. It is more of a resource book than something to be read cover to cover. It's clear why this book has become the standard in the field. It's clear and laden with examples that enliven the techniques discussed in each chapter. The chapter "Forming a Team of Support" is particularly timely as we proceed through the foster-adoption process. This book covers everything on attachment that I had been gathering from conversations, web sites and other books. With short vignettes, diagnosis info, therapy ideas, and parenting suggestions, it is a Must Read for adoptive parents, and a life line for parents of a RAD child. I felt the first half ti be immensely helpful, and worth 4-5 stars. But ss the book continued, it began to feel long and drawn out. The second half felt like a repackaging of love & logic, without the conciseness. I recommend The Connected Child and Love & Logic over this.